All photos by Amanda SchusterBecause I have been gone through extensive training to write, speak and consult about both wine and spirits, people often ask if I prefer one or the other. My stock reply has been, “I love them both - I’m bi-spiritual.” However, I understand why people are compelled to ask this question. In life, barely do the twain meet. Wine people are very much their own sect, with a certain trepidation toward the spirits world, and this is also true of many spirits and cocktail enthusiasts I know who rarely drink wine, or are just too intimidated by the vast scope of its range and don’t know where to begin. Seeking education about an alcohol category is indeed like learning a foreign language - the terms, the tones, the contexts, the tenses. This is perhaps the reason why there are so few wine cocktails that are really cocktails - not merely low ABV mixed drinks that contain wine or sours over which a swirl of wine floats on top - but mixed drinks in which wine is given a starring or heavily supporting role with the inclusion of traditional spirits and ingredients. I met someone in the wine world late last year who challenged me to come up with a way to use Valpolicella - an Italian red wine style from the Veneto that is traditionally lush and fruity with somewhat of a tannic backbone - in a real cocktail. It’s more complicated than it sounds. On its own, this style of wine is a very pleasant, food-friendly sipper, and all the nuances of the grapes in the various blend (traditionally a combination of Corvina, Corvinone, Rondinella and/or Molinara) come together in the glass. However, other spirits and ingredients such as fresh fruit juices could draw out some of the more bitter tannins or too much of its inherent acidity. Also, many wine cocktail recipes, like sangria, are designed to cover up an inferior wine with added fruits and spices as opposed to showcasing a high quality wine and bringing out its good characteristics. So for my first article of the new year, I decided it was time to deliver on this spirited wine challenge. By the way, when mixing these yourself, if not using Valpolicella, use a good quality dry red wine you would sip on its own. They say never to cook with a wine you wouldn’t drink, well, why would you ever do that for a cocktail? For all of these recipes I used Massimago Valpolicella Superiore 2013, but you can use another fruit-driven style of dry red wine. The best place to begin this type of research is to shut off the computer and head to the library (or use a good digital library, such as the EUVS cocktail book database) to see if any of the founding cocktail writers ever attempted such a thing. Of course they did. 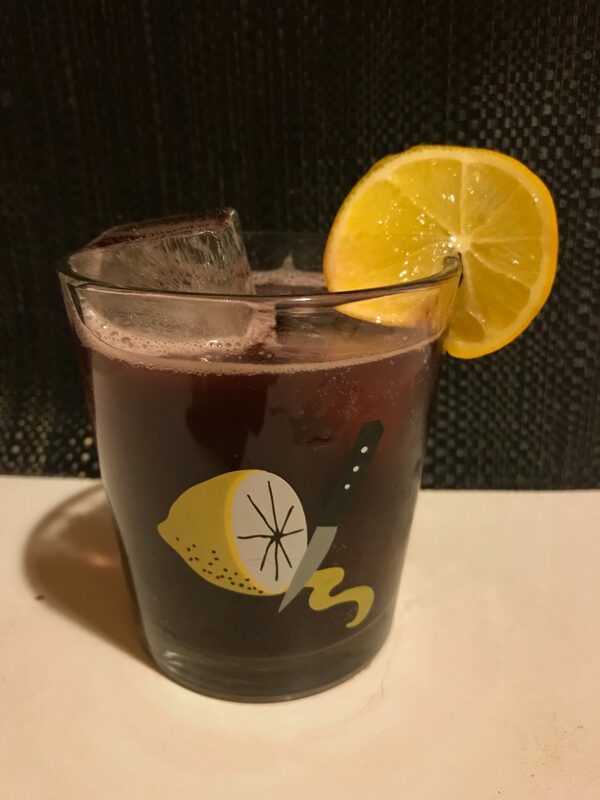 Turns out the less popular cousin of the Sherry Cobbler is a Claret Cobbler, with red wine in the place of the sherry, and there are many variations of this drink including one, of course, in Jerry Thomas’ How to Mix Drinks or the Bon Vivant’s Companion. However, after sifting through a few recipes, I found them to be too watered down, with a detritus of powders and spices (and actual water) in order to make a low quality wine taste more quaffable in the first place. All provided solid arguments for why this drink never caught on. The recipe doesn’t specify which spirit to use but suggests “spirit of choice.” I experimented with different spirits and ultimately gin was the best option. Whisky, brandy and rum are fine to use, but the juniper in the gin best compliments the fresh berry and ripe plum flavors of the wine and lends some extra botanical aromas without clashing with the wine’s natural tannins. It also allows the wine’s own fetching hue to catch the eye. Use a gin that is juniper forward and botanical, like Sipsmith VJOP, Dillon’s Dry Gin 7, Letherbee Original Label (those last 2 won silver in the 2017 New York International Spirits Competition) or Anchor Distilling Junipero. I reduced the wine measure and add a splash of tonic, nature’s gin flavor binding agent. Add all ingredients except tonic to a mixing glass with ice. Shake well. Fine strain into a goblet or julep cup filled with fresh ice pellets or crushed ice. Top with tonic. Garnish. Adding some fresh fruit juice to the mix, another old school recipe is the Claret Cooler, sometimes referred to as “Claret Lemonade.” Here’s our friend Claret again. In the early cocktail era, it was a pleasant way of saying “cheap Bordeaux.” I’ve spotted this recipe in many of the old books, including Harry Johnson’s Bartender’s Manual (1934 edition), and Dale Degroff printed a streamlined version in his Craft of the Cocktail book in 2002. These are nice recipes, but in practice, they could use a little something to draw out the spicier elements of the wine and make the drink taste less acidic. Tinkering with the formula, I found a measure of rum and some bitters do the trick nicely. Since I’m playing with old recipes, I thought the newly updated version of Bogart’s Bitters from Bitter Truth works well here, as they are a very close approximation of what might have been used in bars back in the late 1880s/early 1900s. Angostura would also fit in a pinch. Shake all ingredients with ice. Strain into a double Old Fashioned/rocks glass over fresh ice (medium format square cubes are best). Garnish. The real obstacle in this exercise was coming up with a stirred, non-citrus, whiskey drink with ingredients that truly meshed. In researching red wine cocktails, the only booze-forward recipes I came across either presented the wine mulled with spices or reduced to a syrup. There’s something to that spice idea, but why not try a more simple and subtle approach without whipping out a saucepan and burying the wine in spices? A bit of sweetness is necessary too. That’s why a good nocino or spiced walnut liqueur is a splendid option. The flavors compliment the cask notes of whiskey and the earthier tones of the wine, and the nuttiness adds a necessary richness. The drink comes out soothing, satisfying and dark, and tastes almost like a spiced dark chocolate covered fig. The name is a Brooklyn shout out to Joseph Brodksy’s ethereal essay/prose poem “Watermark,” about Venice in winter time. Stir all ingredients in a mixing glass. Strain into a chilled coupe glass. Garnish with cherry.